As the camp enters its second week, children gain hands on experience in aviation. Elizabeth Webekind creates her model airport runway at Aerospace Camp at the Flying W on July 31. Summer is soaring by, but the kids enrolled in Aerospace Camp at the Flying W Airport are just taking flight. The camp presents an interactive learning experience for children ages 7 to 12 who are interested in all aspects of aviation. 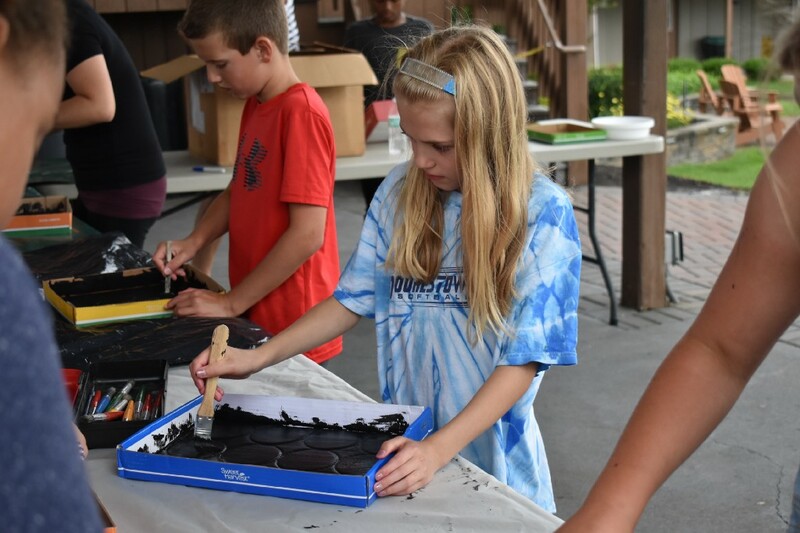 Throughout their time at the camp, they build model airplanes to learn the parts and instruments necessary to make an airplane operate, including the construction of white wing competition flyers, Wright flyers and foam gliders. In addition, they design a rocket to be launched at the end of the camp and create their own model of an airport runway — displaying components such as the compass rose and windsock, that they were able to see firsthand on the runway at the Flying W.
“The camp is hands on. They’re building, they’re thinking, they’re using their creativity and their imagination to design things, and that’s not around as much as it used to be. They tend to do really well with that,” said Camp Director Nancy Lucas-MacPhee. Inspiration to develop the camp struck Lucas-MacPhee 18 years ago, when her son was 7 years old, after he expressed interest in aviation but there were no local opportunities for him to further explore his curiosity. She stated there is a growing need to fill career positions in the aviation field, and this camp can help children explore their interests in potential future careers. This is done through visits by state troopers and Cooper Trauma Center representatives, who speak about the various career paths available to them. Freeflight aviation provides simulation instrument training, and Young Eagles volunteer pilots take the children into the air to receive a free flight lesson on navigating the plane themselves. The goal is to empower the youth to establish F.L.I.G.H.T. values — fearlessness, leadership, imagination, gratitude, honesty and tenacity throughout the two-week camp. The first week is beginner week, and the second is advanced week, which takes place through Aug. 10. Maggie Lau has been a camp instructor alongside Joey Quigley for the past three years, and expressed the excitement she feels when seeing their progression. The cost to attend per child is $325, which includes lunch and all activities. Next years dates have not yet been released. For more information, visit www.aerospace4kids.com.